Our EMV chip-card certifications enables you to integrate POS payments with only a few lines of code. A robust API, shopping cart plugins, and award-winning eCommerce features. Streamline omni-channel payments with all your mobile platforms. Ask us anything, we are here to help. The future of integrated payments, today. Cardknox is the leading developer-friendly payment solution to integrate secure payments in-store, online, or mobile, hassle-free. Integrating EMV payments has never been this simple & flexible. Tap into our native EMV certifications, bypass common challenges, and get ready to take advantage of fast and secure chip-card payments with our leading out-of-scope POS integration. Our solutions make even the most difficult integrations that much easier, so you can get exactly what you need in a lot less time. Our powerful out-of-scope SDK can be integrated with your POS software using only a few lines of code, supporting the most processors and terminals. With advanced tokenization, recurring billing and secure hosted iFields, Cardknox is the smart and flexible solution for online payments. Our developer kits for iOS and Android will make integrating mobile payments a cinch, and unleash the power of Cardknox for your mobile apps. Join the industry’s most aggressive and rewarding partner program with full marketing, onboarding and white-glove support, so you can add and retain more merchants. With an abundance of niche solutions and built-in rate optimization for a variety of industries, it’s no wonder that software developers across every major vertical have made Cardknox their payment integration of choice. If you are a developer looking to integrate with Cardknox, we’ll get you integrated with just a few lines of code. Take our sample code generator for a spin, or explore our API documentation. Built with a deep understanding of developer, merchant, and customer preferences. Described by an industry leader as “magical,” we perform over a dozen checks and route the transaction accordingly. Unlike other fraud tools that provide confusing scores, simple Yes/No decisions are given and all approvals are guaranteed. 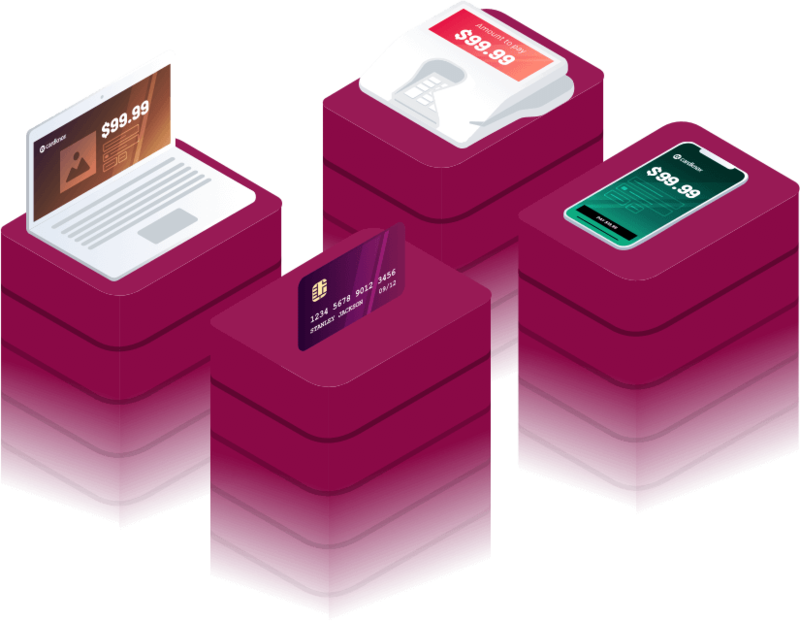 With Cardknox, your system never touches actual credit card data, so you are instantly covered with end-to-end Level I PCI-DSS – no strings attached. Join Cardknox’s EMV developer program and experience our simple solution for EMV integration with POS systems. We have developed a true tokenization system that does not simply encrypt sensitive data, but assigns a unique ID for each transaction. A combination of secure devices, applications and processes make transactions completely secure. Out of 50+ different payment companies I have talked to, Cardknox is by far the best I have worked with. Amazing technology and feature list, exceptional customer and developer support, and unbelievable flexibility. Anything related to payments that we need, Cardknox makes it happen—easy and fast. After using PcCharge software for many years to process our credit card transactions, it was necessary to move to a more secure system. After evaluating numerous solutions, we are glad that we chose Cardknox. Cardknox provides a fast, cost effective, secure credit card processing solution that includes tokenization. Transitioning to the Cardknox system was a smooth process thanks to the responsive technical and customer service support staff. Cardknox attends key industry shows across numerous verticals. Take the opportunity to meet with a Cardknox payments expert by scheduling a meeting at an upcoming show. Create a sandbox account and jumpstart your payment integration. © Copyright . Cardknox Development, Inc.
Failure to comply with any of the specifications will result in Partner being ineligible for the Reimbursement. Cardknox reserves the right to change or terminate this program at any time prior to a Partner being deemed eligible. Partner has an active partner agreement with Cardknox and is in good standing with Cardknox. Partner will submit request for reimbursement within 30 days of QIR certification by providing copy of the QIR invoice, proof of payment and QIR certificate. Reimbursement eligibility is once the Partner is certified as a QIR. Reimbursement will be for the amount paid and shall not exceed $395, the current QIR program training and exam fee. 1 employee per Partner is eligible for this promotion. Retake exam is not eligible for reimbursement. If Partner needs to retake the exam, only the original registration amount will be reimbursed once certified as QIR. Partner agrees to implement Cardknox payments per the QIR requirements and advise merchant to select partner as their QIR when filing PCI compliance. Partner is fully responsible for complying with QIR standards and regulations. Partner will sign up for the QIR program by submitting the QIR form on the Cardknox website within 90 days of signing the Cardknox partner agreement or 120 days of start of this program (10/15/2017) to be eligible for the reimbursement.